Today is the Feast of St. Albert the Great who, along with St. Dominic, are the patron Saints of scientists. In honor of this Feast Day, I am going to restate much of what I wrote on August on the Feast Day of St. Dominic. Specifically, it is a perfect opportunity to correct the false but unfortunately common perception that there is a conflict between science and religion. Part of the reason for that is the poor state of knowledge of both science and theology in the modern world. One of the purposes of this blog is to promote the mutually reinforcing methods of finding ultimate Truths through faith and science. Nicolaus Copernicus (1473-1543). A brilliant man and a Catholic monk, Copernicus held important positions in both secular and ecclesiastical government, all the while writing voluminously. A sophisticated economic thinker, Copernicus was the first to propose that increases in the money supply have a tendency to drive price inflation. But what he is remembered for today is his heliocentric theory of the solar system. Through patient observation and calculation, Copernicus displaced the earth from the center of things, reorienting the way we view everything and thereby ushering in the modern world. Johannes Kepler (1571-1630). Kepler was a brilliant mathematician and astronomer. He did early work on light, and established the laws of planetary motion about the sun. He also came close to reaching the Newtonian concept of universal gravity – well before Newton was born! His introduction of the idea of force in astronomy changed it radically in a modern direction. Kepler was an extremely sincere and pious Lutheran, whose works on astronomy contain writings about how space and the heavenly bodies represent the Trinity. Robert Boyle (1627-1691). Boyle gave his name to “Boyle’s Law” for gases, and is regarded as the father of modern chemistry. As a devout Christian, Boyle took a special interest in promoting the Christian religion abroad, giving money to translate and publish the New Testament into Irish and Turkish. In 1690 he developed his theological views in The Christian Virtuoso, which he wrote to show that the study of nature was a central religious duty.” Boyle wrote against atheists in his day (the notion that atheism is a modern invention is a myth), and was clearly much more devoutly Christian than the average in his era. Michael Faraday (1791-1867). Michael Faraday was the son of a blacksmith who became one of the greatest scientists of the 19th century. His work on electricity and magnetism not only revolutionized physics, but led to much of our lifestyles today, which depends on them (including computers and telephone lines and, so, web sites). Faraday was a devout Christian which significantly influenced him and strongly affected the way in which he approached and interpreted nature. Gregor Mendel (1822-1884). Mendel was an Augustinian monk and professor of natural philosophy and eventually became the abbot of his monastery. And today he is recalled for his path-breaking studies of pea plants which showed the existence of recessive and dominant genes, an essential cornerstone of modern genetics. Pierre Teilhard de Chardin, S.J. (1881-1955). My personal favorite. Teilhard de Chardin was a Jesuit priest, paleontologist and geologist from the early 20th century. Teilhard de Chardin’s primary field of study was human evolution. Teilhard de Chardin was a leader of the team that discovered the Peking Man, now known as Homo Erectus, in 1929. Teilhard worked hard to integrate his scientific findings into a broad vision of Christianity. Although Teilhard had some disagreements with the Church during his lifetime on the theological implications of evolution, the Church fully supported and encouraged Teilhard’s scientific research and publications. Today, Teilhard’s core ideas on the marriage of evolution (both cosmic and biological) and theological evolution (all of natural and spiritual creation is evolving towards a deeper union with God) is accepted as part of mainstream Christian theology. Georges Lemaître (1894-1966). Known as the “father of the big bang,” Lemaître was a Belgian priest who first developed the theory of that the Universe originated in an instant flash now known as the Big Bang. Fr. Lemaître did his graduate work in theoretical physics at Cambridge University and Harvard. In 1927, while still a junior lecturer at the Catholic University of Louvain, he proposed an expansionary theory of the universe at odds with the then-prevailing belief that the universe had always existed in a steady state. Four years later, in 1931, he asserted that the entire universe began with what he called a “cosmic egg” or “primeval atom”. This theory was ridiculed by leading scientists of the time such as Albert Einstein and Sir Fred Hoyle (the latter derisively dismissed Lemaître’s theory as “the big bang”). Later that same year, Fr. Lemaître argued that not only was the universe expanding, its expansion was accelerating in speed. While it has taken decades, Lemaître’s theories have been confirmed in every major particular. John Polkinghorne (1930 – Present). Dr. Polkinghorne is an English theoretical physicist, theologian, writer, and Anglican priest. He was professor of Mathematical physics at the University of Cambridge from 1968 to 1979, when he resigned his chair to study for the priesthood, becoming an ordained Anglican priest in 1982. He served as the president of Queens’ College, Cambridge from 1988 until 1996. Polkinghorne is the author of five books on physics, and 26 on the relationship between science and religion; his publications include The Quantum World (1989), Quantum Physics and Theology: An Unexpected Kinship (2005), Exploring Reality: The Intertwining of Science and Religion (2007), and Questions of Truth (2009). Francis Collins (1950 – Present). Dr. Collins is an American physician-geneticist noted for his discoveries of disease genes and his leadership of the Human Genome Project (HGP). Collins led one of the groups to first sequence the human genome. He currently serves as Director of the National Institutes of Health in Bethesda, Maryland. Prior to being appointed Director, he was the founder and president of the BioLogos Foundation, an organization which promotes discourse on the relationship between science and religion and advocates the perspective that belief in Christianity can be reconciled with acceptance of evolution and science. Collins also wrote the New York Times bestseller, The Language of God: A Scientist Presents Evidence for Belief, which discusses Collins’ conversion from atheism to Christianity, evaluates the evidence for Christianity, and argues for theistic evolution. In 2009, Pope Benedict XVI appointed Collins to the Pontifical Academy of Sciences. This entry was posted in Reason and Faith, Uncategorized and tagged Blaise Pascal, Catholic Saints, Catholic scientists, Doctor of the Church, Doctors of the Church, faith and reason, Faith and Science, Francis Collins, George Lemaitre, Gregor Mendel, Johannes Kepler, John Polkinghorne, Michael Faraday, Nicolaus Copernicus, reason, reason and faith, Robert Boyle, science, science and faith, St. Albert, St. Albert the Great, St. Dominic, teilhard de chardin. Bookmark the permalink. Thank you Claire. I hope you have a joyful weekend! Reblogged this on Reflections on Scripture, etc. Thanks for the reminder. 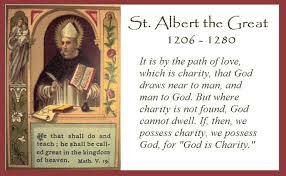 Saint Albert the Great, pray for us! That’s a great list! Thank you for reminding us about these great ones. I have read Collins and hope to read Polkinghorne. Thank you for the Peter Kreeft book. It sounds fascinating. I always enjoy Peter Kreeft even if I do not always agree with him. He is very logical and funny in a weird sort of way which I can relate to. thank you for this wonderful list to celebrate the Feast of St Albert. Tomorrow is the Feast of St. Albert the Great, one of the patron saints of scientists. I am reblogging this from last year.